The goal of our laboratory is to develop micro- and nano-scale bioprinting and 3D printing techniques to create 3D designer scaffolds for tissue engineering and regenerative medicine. In this talk, I will present my laboratory’s recent research efforts in rapid continuous projection 3D bioprinting to create 3D scaffolds using a variety of biomaterials. These 3D biomaterials are functionalized with precise control of micro-architecture, mechanical (e.g. stiffness and Poisson’s ratio), chemical, and biological properties. Design, fabrication, and experimental results will be discussed. Such functional biomaterials allow us to investigate cell-microenvironment interactions at nano- and micro-scales in response to integrated physical and chemical stimuli1. From these fundamental studies we can create both in vitro and in vivo tissue models for precision tissue engineering and regenerative medicine2. X. Ma, X. Qu, W. Zhu, Y.-S. Li, S. Yuan, H. Zhang, J. Liu, P. Wang, C. S. Lai, F. Zanella, G.-S. Feng, F. Sheikh, S. Chien, S.C. Chen, “A Deterministically Patterned Biomimetic Human iPSC-derived Hepatic Model via Rapid 3D Bioprinting”, Proceedings of the National Academy of Sciences (PNAS), Vol. 113 (no. 8), pp. 2206-2211, 2016. 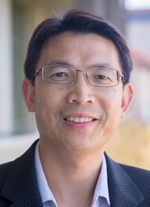 Dr. Shaochen Chen is a Professor and Vice Chair in the NanoEngineering Department and Professor Affiliate in the Bioengineering Department at the University of California, San Diego (UCSD). He is a founding co-director of the Biomaterials and Tissue Engineering Center at UCSD. Before joining UCSD, Dr. Chen had been a Professor and a Pearlie D. Henderson Centennial Endowed Faculty Fellow in Engineering at the University of Texas at Austin from 2001 to 2010. Between 2008 and 2010, he served as the Program Director for the Nanomanufacturing Program of the National Science Foundation (NSF). Dr. Chen’s primary research interests include: biomaterials and 3D bioprinting, stem cell and regenerative medicine, tissue engineering, laser and nanomanufacturing. He has published over 110 papers in top journals and 12 book/book chapters. Among his numerous awards, Dr. Chen received the NSF CAREER award, ONR Young Investigator award, and NIH Edward Nagy New Investigator Award. Dr. Chen is a Fellow of AAAS, AIMBE, ASME, SPIE, and ISNM.